My early ancestors had more of the �terrier� look than I do. Then, in the 1800�s, the English Toy Spaniel, the Yorkshire Terrier, and the Pekingese were among other breeds used in cross breeding programs to refine and fine tune the Griffon body style that you see today. I am a stout and very active little dog. I don�t need a lot of room to run and exercise, so I make a great pet for small spaces, like apartments. I am independent, but I still enjoy the company of humans very much. If I am informed of the house rules and not allowed to become spoiled (this is the hard part! ), I am an obedient, pleasant household pet. When fully grown, I am between 7 and 8 inches tall (17.8 to 20.3 centimeters) and I weigh between 6 and 12 pounds (2.7 to 5.4 kilograms). 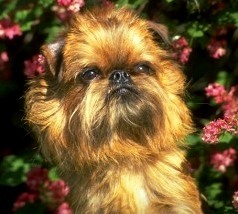 We have no Brussels Griffon Breeders listed at this time. Click here to place your Brussels Griffon Ad!